A defining moment in U.S. history, Lewis and Clark’s exploration to find a navigable passage to the Pacific Ocean laid the foundation for what the American West would become. The Corps of Discovery reached the Pacific Ocean via the Columbia River in the fall of 1805, 1 1/2 years after starting their voyage in St. Louis, Missouri. Before returning east, however, the Corps needed to resupply themselves and wait out the winter months as snow and extreme cold made the numerous mountain ranges along the route impassable. Originally the group had settled on the Washington side of the Columbia, and they even debated establishing a camp farther upriver. Based on a recommendation from the local Clatsop tribe, the group resettled on the Oregon side of the river just outside of Youngs Bay along the Netul River, where large herds of elk and deer were said to graze. In just three weeks, half of the Corps constructed the two-building fortress and camp, while the other half were tasked with hunting and acquiring the salt* that would be necessary to cure the meats. The entire Corps endured the long, wet, and notably monotonous winter in the same building, with Meriwether Lewis, William Clark, Sacagawea, her husband Toussaint Charbonneau, and their baby in one side and the rest of the Corp in the other. On March 23, 1806 the team hastily left Fort Clatsop. Over the years moisture and decay overran the structure, returning it slowly to the forest. The fort building that visitors tour today is a well-crafted replica, reconstructed in 2006 after the original 1955 replica was severely damaged by a fire in 2005. 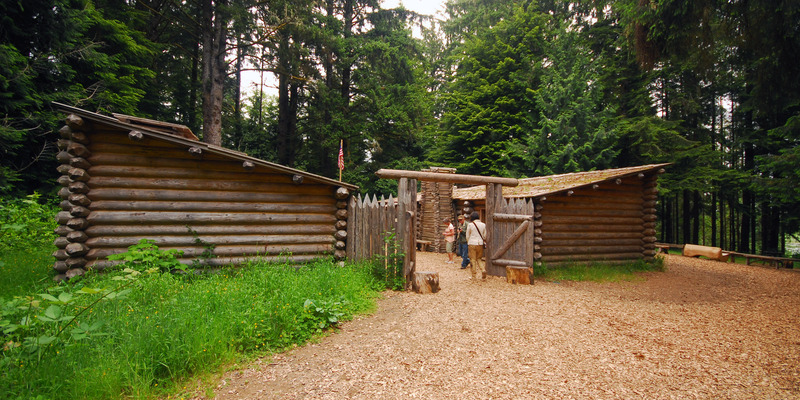 In addition to the Fort Clatsop replica, visitors will enjoy the park’s numerous interpretive hiking trails, including the Netul River/South Slough Loop Trail, day use picnic areas, a museum and education center, and the park’s gift and book store. * Salt Cairns and kettles were used at the Corps Salt Makers’ Camp, located in present day Seaside, Oregon, to extract the highly useful mineral.